James Bond looks ready for just about anything, anytime. Something tells me he eats a good breakfast before starting his day. It’s not like he can time his break, or know exactly when he’ll be free for lunch. He may not even get lunch, he’s so preoccupied with catching the bad guys. So when he does eat a good breakfast, it may look like Toasted Steel Cut Oatmeal 007. Guaranteed to give you strength throughout the morning and fill you with superpowers, oatmeal is a superfood, after all. 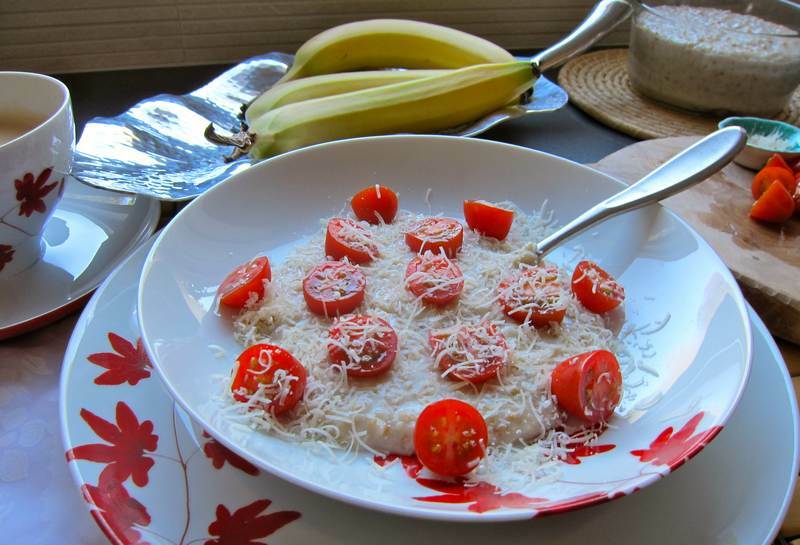 This savoury style of oatmeal is reminiscent of risotto. Enjoy it any time of day for a delicious and nutritious meal. Heat the water and milk to a simmer in a pot, on medium heat. Melt the butter in a frying pan, over medium heat. Add the oats to the butter, and stir for 2 minutes to toast. Add the oats to the heated milk, and cook on medium-low for about 30 minutes, stirring and adding the salt at half time. Allow the oatmeal to set for 5 minutes before serving. Garnish to your taste. Serve 4, stirred, not shaken. The ungarnished oatmeal can stay in the refrigerator and get reheated as required. Add a little water, then heat in the microwave on power 7, stirring to get an even texture. 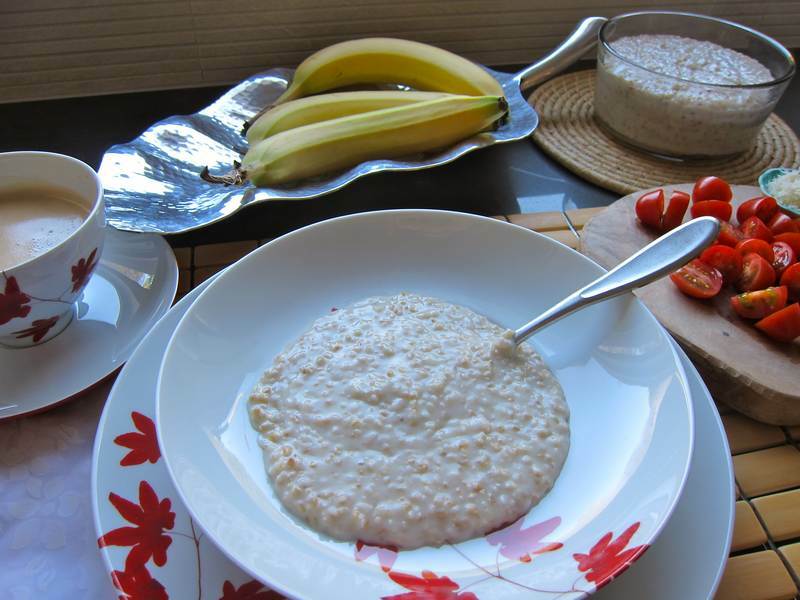 This oatmeal recipe is based on the America’s Test Kitchen Healthy Family Cookbook. They put science first, so their methods are sound. 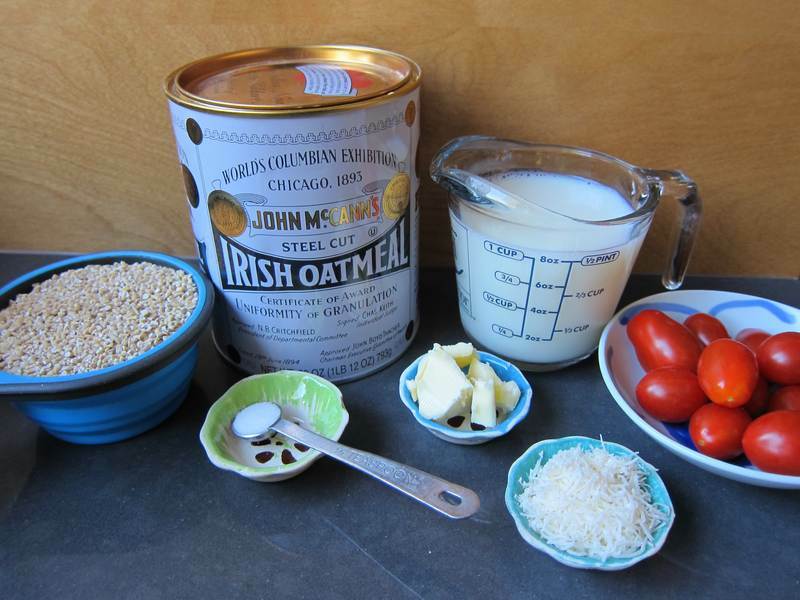 Thanks to Shelley Alper for passing on this Steel Cut Oatmeal recipe suggestion. For a whole slew of fabulous oatmeal recipes, take a look at the Kitchn’s Rethinking Oatmeal: 7 Savoury Morning Recipes. « Delicata Squash Stacks – A Thanksgiving Delight! There was a steel-cut oat torta in the NY times recently–another savory take on oats! I am a savory breakfast person myself, so I’ll have to try this combination. It amazes me that you have time to try recipes…what with all your non-stop creating. I’m happy to go savoury or fruit-sweetened in the morning. i grew up eating salad for breakfast – especially on the weekends. Holly where did you get these Irish oats? I picked up a can in Virginia a couple of years back but haven’t seen them since. Others are not quite as tasty. Available in Canada you say? I think Supermarche PA has them. I bought them a while ago. I’ll keep an eye out. Got any great recipes to share? I know you’d love a bottle of Blackcurrant Vodka! I love to use oat groats. You can soak them overnight so that they cook quickly in the morning. Very nutritious and great with some Doterra Essential Oil such as cinnamon, ginger & cardamom. Great for warming us up on those cool fall mornings. Sometimes I just eat them after soaking. Cinnamon, ginger cardamom flavour sounds intriguing!